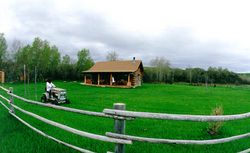 Leininger Ranch Log Cabins provide comfortable and private accommodations on a scenic ranch near Lewistown any time of year. Three charming log cabins sleep up to 4 or 9 each and include full kitchens, private hot tubs, BBQ grills and beautiful views. There is plenty of wildlife for fishing, hunting, photography and bird watching. Our guests take care of themselves while we attend to the agricultural demands of the ranch that include raising beef cattle, quality hay and grain. When time permits, we enjoy showing cabin guests our antique barbed wire collection and the fossils, artifacts, buffalo jump and mammoth bones found on our ranch. Directions: Leininger Ranch is located just 10 miles west of Lewistown, Montana. From Lewistown, travel 5 miles west on Highway 87, then 2 miles north and 3 miles west on Lower Cottonwood Creek Road. From Eddie's Corner, travel 12 miles east on Highway 87, then 2 miles north and 3 miles west on Lower Cottonwood Creek Road. Call for more information.